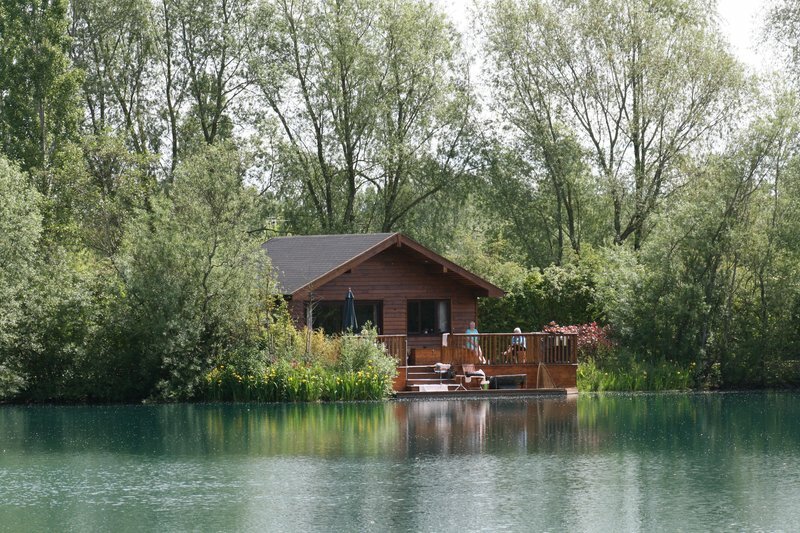 The Cherry Lakes Lakeside Lodges are the perfect way to enjoy the outdoor experience and fish from your doorstep whilst enjoying all the luxuries of home. So if your idea of heaven is an idyllic log cabin holiday on the banks of a lake and waking up to the sound of water lapping at the deck a few steps from your bedroom, then look no further. The Lodges have all been designed with the non-fishing partner in mind and whatever the weather outside you will always be warm, comfortable and relaxed inside them. Cherry Lakes aims to become ‘the’ destination of choice for fishing holidays in the UK by appealing equally strongly to both the angler and their non-fishing partner. The feedback we get from our guests about the Lodges has always been very strong. All of our one bedroom luxury Lodges are fitted to a high standard. 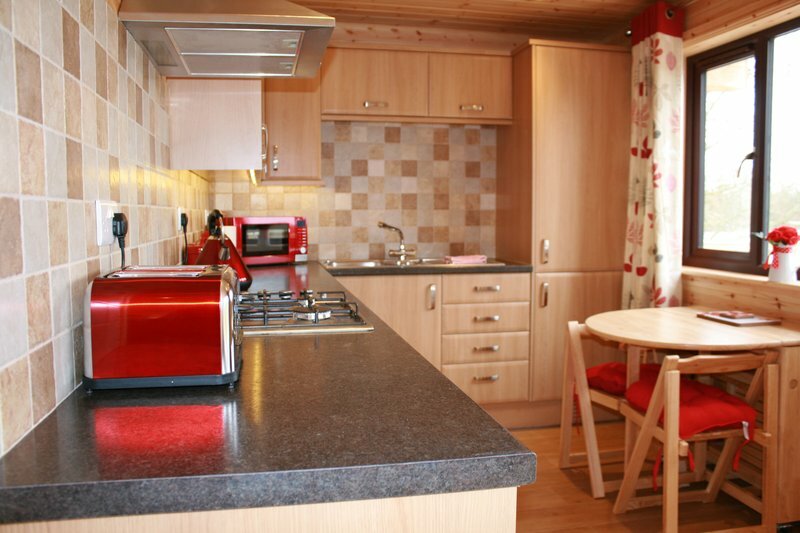 The Lodges are centrally heated and provide a great view out over their respective lakes. The kitchen is fully fitted with all the plates, saucepans, kettle, utensils, microwave, cooker and hob etc that you would expect for a self-catering holiday. The large upright fridge-freezer has plenty of space for food and for storing some frozen boilies. There is a good sized bathroom with a large shower. The bedroom has a wardrobe as well as a comfortable double bed. The lounge has a Smart TV and DVD player, as well as a comfortable sofa bed. The layout of all of our one bedroom Lodges are the same and can be seen by scrolling further down this page. Please see Pochard Lodge if you need two bedrooms. Outside of the Lodge is a large area of upper decking. This area has a patio table and chairs along with a parasol. It also has a large lockable bench which is ideal for keeping some of your tackle as well as charging your Bait boat. Best of all is the purpose made BBQ holder which takes all sizes of disposable BBQ trays.....so no need to wash the BBQ! This upper deck is a great place to look at the beautiful lakes and banks and enjoy the peaceful environment of the Cotswold's countryside. If you also have a little relaxing drink in your hand then so much the better. The lower deck is the fishing platform where the rods live on their rod pods during your stay, along with the Carp cradle, landing net and weigh sling which we provide. We have taken every step to ensure you feel safe and secure whilst at Cherry Lakes. There is only one entrance and this is through electric gates which also have CCTV cameras. All the external fences are 6 feet high and we also have security lights around the sites as well as Lodges. Similar to all the other Cherry Lakes Lodges, guests can drive up to their Lodge to load and unload their cars on arrival and departure. During your stay all cars are parked in the car park. We are sorry but due to the close proximity of the water children under 12 are not allowed in the Lodges. Babies are very much welcome until they start toddling. Children are always welcome in Cherry Lake Cottage as it is set back from the waters edge. 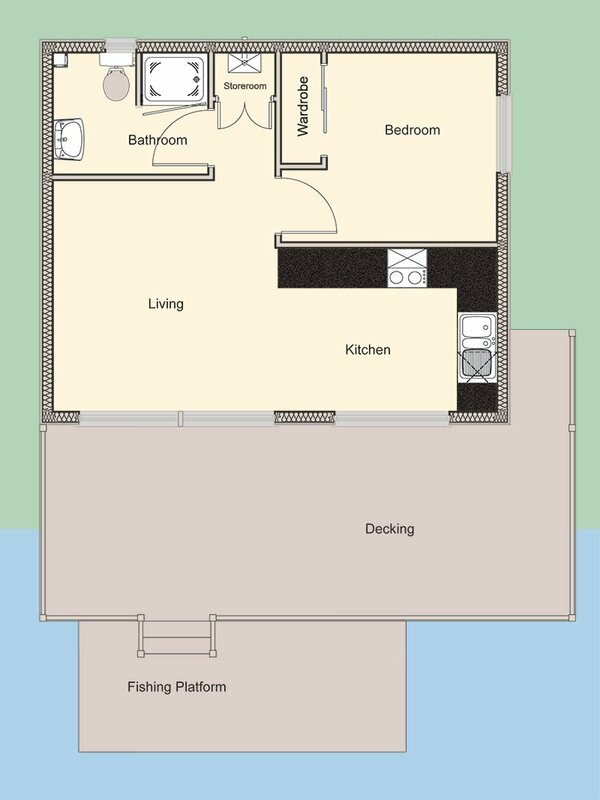 The one bedroom Lodges all have the same layout and this can be seen below.